Colombo, Sri Lanka -- The acceptance of Buddhism by several thousand Dalits or Untouchables of India last week, marking the 50th anniversary of the great Indian freedom activist and architect of the Indian Constitution Dr. BR Ambedkar's own acceptance of Buddhist teachings in preference to caste-ridden Hinduism, together with thousands of Dalit followers, found only brief mention in the Sri Lankan media. This was so even about last month's election of the Dalit and Bahujana Samaj Party (BSP) leader Mayawati as Chief Minister of Uttar Pradesh (UP), in a sweeping electoral victory humbling both the Congress Party and the ruling Alliance in New Delhi, and the Opposition and pro-Hindu Bharathiya Janatha Party (BJP). While the deeper political implications within India of the BSP's success in UP did not seem to interest most political commentators here, including India watchers, surprisingly the significance of this latest wave of embracing Buddhism by the Dalits too seem to have been either missed or ignored on this side of the Palk Strait. In a largely Buddhist country, following the Theravada school of Buddhism that was accepted by Dr. Ambedkar in his rejection of caste-dominated Hinduism, one would have expected both Dr. Ambedkar himself and the-new surge of Buddhism through its acceptance by the Dalits on such a large scale, to have a much greater interest and impact over here. 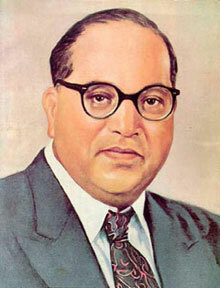 The lack of knowledge about Dr. Ambedkar, his role in the Indian Freedom Movement and contribution to the guiding principles of Indian law, could be attributed to the insular and limited scope of education in Sri Lanka, and the frightening lack of general knowledge among the products of this system. (All of the recent applicants I recently interviewed for a media related position, including several graduates, could not name the current Prime Minister of India. One of 20 applicants said it was "one Mr. Singh"). It is in the face of such an appalling lack of knowledge about our immediate neighbour, relations with whom are very often highlights in the media, which makes one think it is time Sri Lanka made a deliberate move to better understand developments in India, both as part of general and tertiary education, and in the larger fields of cultural and political awareness. Until recently, Sri Lanka was the country that provided the largest number of tourists to India annually. This may be so even today. The bulk of these visitors are the Buddhists who go on pilgrimage to Buddha Gaya, Saranath and other places of Buddhist pilgrimage. (A free flight to India with opportunities to visit the Buddhist sites there is part of promotion now being done by an FM station broadcasting in Sinhala. The SMS and postcard competition is having a huge response). Sri Lanka has a constitutional provision that gives foremost place to Buddhism, and there is a political party already represented in parliament that seeks to establish a 'Dharma Rajya' a system of governance based on the teaching of the Buddha. One would expect that such an interest in India, particularly in its historic links with the Buddha and Buddhism, would make current developments about Buddhism in India be of much greater interest over here, than one sees today. Regrettably though, this is not the case; which calls for a serious re-think of our understanding and awareness of India and the many developments there, apart from Bollywood, India's rapid economic growth and regional influence. Politically, the success of Mayawati in leading a coalition to unprecedented victory in UP is a lesson to our own political thinkers of how a successful coalition of divergent forces could be forged. Although chosen Chief Minister of UP on earlier occasions as a Dalit leader having unstable coalitions, Mayawati changed her tactics a few years ago. She moved to bring the Hindu Brahmins, whom she once asked her people to chase away with slippers, as well as the Muslims, into a new umbrella coalition of caste and religion, realising the growing weakness felt by the Brahmins and the Muslims due to the advantages gained by the intermediate Hindu castes today, thanks to the proportions set apart by law for scheduled and other castes in employment, education etc. Her new UP Cabinet has an interesting mix of Dalits, Brahmins, other Hindu castes and Muslims. M.P. Her approach is one of inclusiveness, which has brought about electoral success ensuring a stable administration in UP for several years, and also poses a major challenge to the main political parties of India, even in the campaign to capture power in New Delhi. For those who see the importance of inclusive politics as an answer to our current crises, there is much to learn from the success of Mayawati, the Dalits and the BSP. The mass acceptance of Buddhism by several thousand Dalits last week, following the example of Dr. Ambedkar, brings a new dimension into Indian politics. Although the post-Ambedkar Buddhists of India have not emerged as a strong political force as yet, the possibilities of such an emergence is already seen by political analysts in India. Immediately after the election of Mayawati as the new Chief Minister of UP, India's NDTV which gives the impression of a pulse-beat TV channel, had a participatory talk show that discussed the future of the Politics of Caste in India. There were no conclusive findings, but there was general agreement that the Politics of Caste would remain in place for many more years. The grip of caste and religion on Indian politics will also depend to a large extent of the country's economic growth coupled with the rise in education and the mobility of its work force. In the cauldron of political development in India, the new strength of the Dalits and the acceptance of Buddhism by large numbers of them bring a new dynamic into the politics of India. Although it may take many years to achieve fruition there are signs that secularism is on the rise in India and that the hegemony of the Hindus is under threat. It is in Sri Lanka's own interest, therefore, to have a good understanding of these trends and see how best they could impact on Indo-Sri Lanka relations in the future. Due to historical reasons, particularly British imperialism and the plantation economy, as well as the common language and religious links among the Tamils and Hindus in Sri Lanka with those in South India, the pressure groups on Sri Lankan affairs in India have been almost exclusively from Tamil Nadu. While this historical reality has to be accepted, there is no reason why this should always be so, in the context of changing developments in India. Even though late, it is time that political thinking in Sri Lanka considered more diverse relationships with emerging power centres, and groups with potential for new pressures on the Indian establishment. The path shown by Dr. Ambedkar in his break with the Hindu dominance of Indian politics, which included his disagreements with Indian leaders including Mahatma Gandhi, is a good pointer to Sri Lanka on the formulation of new strategies in relationships with our immediate neighbour. The mantra-like repetitions about our historic links and cultural links with India, especially the strong link of Buddhism, would mean little unless the new developments vis-...-vis Buddhism in India are properly understood and efforts made to establish lasting links with this new sector of emergent power in India. In his rejection of caste-based Hinduism and the embrace of the humanitarian teaching of Buddhism where caste is anathema, Dr. Ambedkar has shown the way for those who seek to overcome the dominance of a powerful establishment, ingrained in the traditions of the past. Any forward looking policies for Sri Lanka should similarly consider how best the old formulations of power can change both internally, and in our dealings with our neighbours. The search for inclusiveness in domestic politics should extend to serious attempts to include influence groups and people other than those in South India in our overall dealings with India. Significantly, Dr. Ambedkar never saw Buddhism as an option for Hindus only. His thinking was in terms of a "Prabuddhi Bharat" - an enlightened India. There can be much common interest in seeking such enlightenment in our dealings with our immediate neighbour.